This image shows the debris disc around the star Gliese 581 as seen with Herschel at far-infrared wavelengths. Gliese 581 is an M-type star that is known to host at least four planets, all of them with low masses – between twice and 15 times the mass of Earth – and with orbits within 0.22 AU from the star. Two of these super-Earths are located in the so-called habitable zone – the distance from a star where water may be found in liquid form. The debris disc discovered with Herschel extends from 25 to 60 AU from the star. A sketch of the debris disc and the orbits of the four known planets is superimposed on the image. The relative sizes of the disc and planetary orbits are not drawn to scale: the disc is about 100 times larger than the orbit of the outermost planet. 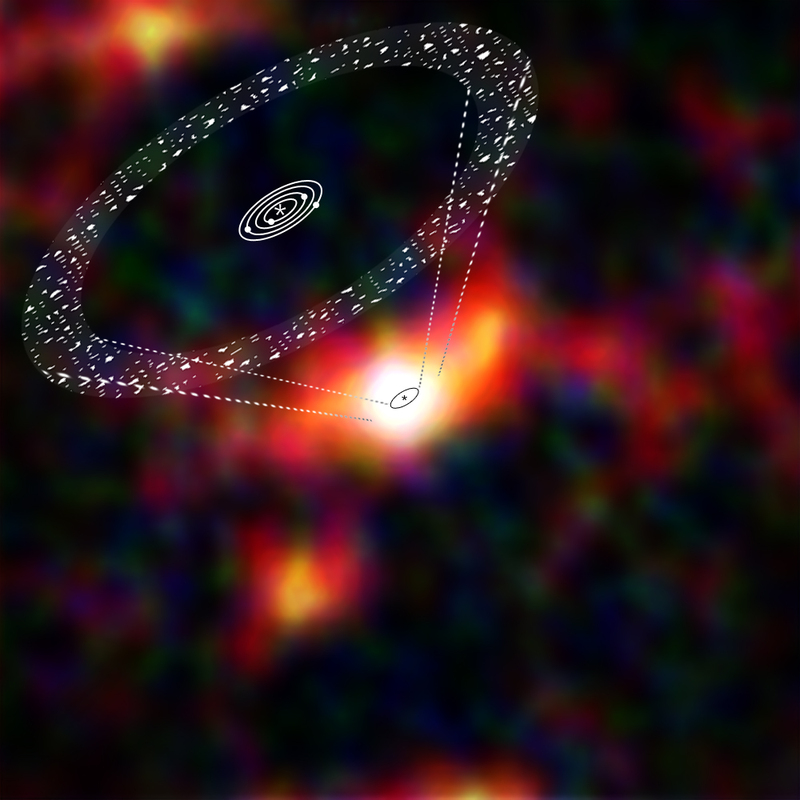 There are also background, extra-galactic sources visible in the image: these are the tail-like feature, visible in yellow/red to the right of the disc, and the yellow/red objects to the lower left of the disc and in the upper left corner of the image. The image is based on data gathered with the PACS instrument on board Herschel at wavelengths of 70 microns (blue), 100 microns (green) and 160 microns (red), respectively.